Two-roomed apartment of 35 square meters (375 square feet) with an intermediate floor, sleeps 2+1, composed of: living-room with a sofa-bed for a person downstairs and a double-room upstairs, bathroom with shower, balcony with a splendid sea-view. This apartment hasn’t the cooking-corner. Ludovica type D is a charming apartment, 35 square meter (375 square feet) large, for 3 people, located in the center of Positano, and with a splendid sea view. It has one bedroom with a double bed, and a living room with a sopha bed. The apartment is equipped with air conditioning. The sea and the beach of Positano (Spiaggia Grande) are 1 km (approximately half a mile) from Ludovica apartment type D. At approximately 250 meters (270 yards) from the apartment you will find an elevator to reach the sea and the beach facilities. 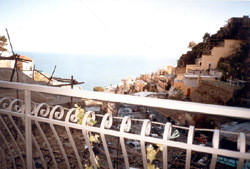 The living room has a lovely small balcony, with a great view of the sea and of Positano. In the living room you will find a table with chairs and a sopha-bed for 1 guest. The bedroom, with a double bed, is placed on an elegant mezzanine level, overlooking the living room. 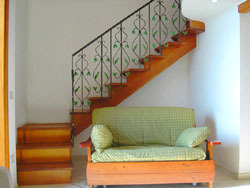 You will enter the bedroom from the living room through a wooden stair. The room is large and comfortable like a regular bedroom. The bathroom has a shower and a wall mounted hairdryer. The apartment has no kitchen-corner. The floors are tiled with lucid Vietri majolica tiles, decorated with flowers, and the furnishing is new and very pleasant. The apartment is part of an ancient building of Positano, elegantly renovated, both externally and internally. 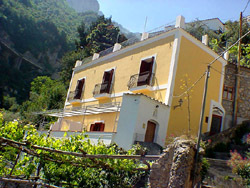 This building is itself part of the characteristic landscape of Positano. It is located halfway between the coast road and the sea, in a central position inside the village.To reach the apartment, You have to climb up a staircase of roughly 50 steps – no lift- , but consider that this is the feature and the beauty of Positano: steps everywhere. A curiosity: if You wish to appreciate the local cuisine, we suggest You for fish the resaurant “Chez Black” on the Positano beach. You spend something more than an ordinary restaurant but it is definitely worth it. But You like eating meat, so don’t hesitate to go to the restaurant “La Tagliata”: it is in the “Nocelle”, a place near Positano. You don’t spend so much and it is spectacular.